The Southwest Ohio Regional Training Center (SWORTC) is housed at 420 Wards Corner Road, Suite J, Loveland, OH 45140. 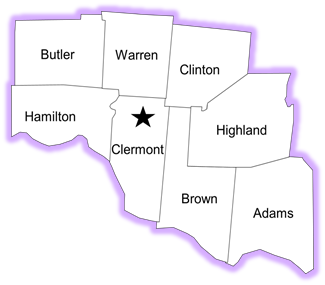 Part of the Ohio Child Welfare Training Program (OCWTP), the SWORTC is committed to providing high quality, culturally- responsive, family-centered, job-related training for child welfare staff and foster parents inthe region's eight counties: Adams, Brown, Butler, Clermont, Slinton, Hamilton, Highland, and Warren. In cooperation with the Ohio Department of Job and Family Services, the Public Children Services Association of Ohio, and the Institute for Human Services, the staff of the SWORTC has provided competency-based training since 1986. Please review our current staff and caregiver training calendars and complete an online training registration form. Add or update an E-Track record. Interested in participating in the OCWTP coaching program? Coaching request forms are available below. RTC staff will contact you with additional information upon receipt.